The vehemence of journalists' reactions surprised most observers. Traditionally, interactions between the president and the press in Mexico were carefully scripted affairs.4 Questions were often planted by government officials; independent newspapers were underrepresented if they were represented at all; and the entire performance was carefully edited before being rebroadcast by the country's reliably pro-government media conglomerate, Televisa. Aggressive and hostile inquiries were simply not part of the regularly scheduled programming. Reporters' reactions to the malosos incident exemplified the changes that had taken place in Mexico's media. In the 1980s and 1990s, independent publications emerged and flourished, supplanting their more staid and traditional counterparts. Feisty talk-radio shows came to dominate the airwaves in Mexico's largest cities. Even broadcast television, once notoriously pro-government, began to devote more coverage to civic and opposition groups. These changes brought increased attention to the viewpoints of civil society, more even-handed coverage of electoral campaigns, and more aggressive investigation of potential scandals. Nor is the media's newfound influence limited to Latin America. In a range of other fledgling democracies, the media play a crucial role in shaping public opinion andñat least in theoryñguaranteeing the accountability of government officials.10 The media's role is particularly crucial in countries where traditional intermediaries (such as political parties and interest groups) remain underdeveloped and where social movements that blossomed during democratic transition have begun to shrink or disappear. Over the last two decades, scholars have devoted a tremendous amount of attention to the spread and deepening of democracy around the world. Despite this burgeoning literature on democratization, however, there has been little serious research on the emergence of independent media. How does a free press, presumably one of the most vital ingredients in modern democratic governance, develop? What role does it play in promoting democratic transition? While theorists of democratization have lavished attention on constitutional design, electoral systems and political parties, social movements, interest groups, civilian control of the military, and related topics, they have left such questions about the media not simply unanswered but virtually unaddressed. This omission is puzzling, given the crucial role that the mass media play in modern democracy. Without a relatively diverse and independent press, it is difficult to see how citizens can acquire sufficient information to make meaningful political choices or hold government representatives accountable for their decisions. If the information on which citizens base their political attitudes is censored or distorted, proper evaluation of official decision making becomes difficult, and mass opinion itself appears increasingly manufactured. For these reasons, scholars generally acknowledge that the mass media represent a crucial element of democratic governance.11 Media freedom is a core ingredient both in theoretical conceptions of democracy (e.g., Dahl's) and in empirical measurements of it (such as the Freedom House index).12 But analysts do not understand what factors contribute to the emergence of independent media. Nor do they understand the political consequences of changes in media coverage on democratizing countries. How, exactly, does a free press arise? How does it escape from, evade, or resist official control? And what effect does its success in doing so have on political transition? Although little explicit research has been done on these questions, there is a default hypothesis that answers them both: the emergence of a free press is simply a product of broader opening in the political system. Political reforms reduce censorship, and full-fledged democratization ultimately guarantees media freedom. From this perspective, the media exert little real influence over the course of regime change; any role they play is essentially epiphenomenal. Media openingñthe process by which mass media become more representative of societal viewpoints and more independent of official controlñis thus merely a by-product of democratization. There is an important element of truth to this argument: political liberalization does promote media opening. By itself, however, political liberalization does not guarantee independence or diversity in the media. Or, to put the matter more bluntly, a free press does not appear, like Aphrodite on the waves, in the wake of regime change. Many new democracies have emerged from political transition with media that are hobbled by politicized state ownership (Hungary and the Czech Republic),13 corruption (Korea),14 private concentration in the hands of like-minded entrepreneurs (Brazil and Russia),15 and other unsavory inheritances. Official tolerance and political reform are at best necessary conditions for media freedom, not sufficient ones. To really understand the emergence of independent media, scholars must look elsewhereñto a number of other variables that shape media coverage. Aside from political liberalization, factors like commercial pressure, journalistic norms, and (less frequently) new communications technologies can also prove powerful in promoting independence and diversity in the media. In Portugal and Spain during the late 1970s, for instance, market competition between different outlets led to significant changes in coverage without full liberalization of the political environment. In Taiwan, the spread of illegal cable television systems frustrated official attempts at censorship long before the end of martial law.16 And in Communist East Germany, much of the population could receive nightly broadcasts in their native language from West German stations well before the fall of the Berlin Wall.17 In other words, the "Aphrodite-on-the waves" argument overlooks a series of other factors that encourage media freedom. Political opening may be an important contributor to the emergence of an independent press, but it is not the only one. Even more seriously, though, models in which changes in press coverage depend on political reform misstate the relationship between media opening and political transition. They portray the press as a sort of free rider on democratizationñas one Mexican journalist put it, not a locomotive of change but a caboose of the state.18 Rather than promoting regime change, the media are simply dragged along by larger political developments over which they have little influence. This interpretation, of course, does not accord with the salient role that mass media have played in democratization in countries from the fall of Ferdinand Marcos in Philippines to the campaign for direct elections in Brazil to the failed Soviet coup attempt of August 1991. In the chapters that follow, I argue that both pieces of the traditional argument are wrong. First, political liberalization is not the sole or even the most important driver of change in the media. Journalistic norms and commercial competition between media outlets also play powerful roles in shaping the behavior of the press. In Mexico, for instance, journalists' views about their role in society were a decisive factor in the establishment of independent publications. Subsequently, competition for readers proved crucial in strengthening these publications and putting pressure on more traditional dailies to change their coverage. Throughout this process of opening in the print media, political pressures frequently worked to stifle changes in the media that were occurring for other reasons. By the early 1990s, Mexico's emerging Fourth Estate had gone well beyond what the government deemed acceptable. At that point, however, many independent publications were sufficiently well established to fend off official assaults. Market competition plays a powerful role in encouraging the press to experiment with more independent coverage. Even in an authoritarian system, private media may face powerful incentives to meet audience demands. In Mexico, for instance, television was long dominated by a single private network (Televisa) that consistently supported the ruling party and limited opposition access to the airwaves. In its capacity as ruling party cheerleader, Televisa helped sell PRI to an increasingly dubious mass public. Following the privatization of government-owned television channels in 1992-93, however, competition between television networks led to greater coverage of civic groups and opposition parties on the once reliably pro-regime network. Second, I argue that changes in media coverage themselves exert a powerful influence on politics and political transition. In Mexico, for instance, independent publications declined to play the role of official scribe for the political elite, turning their attention instead to newly formed civic organizations. Beginning in the mid-1980s, media attention helped to legitimize these new groups by developing a new vocabulary for describing the Mexican political context. Media opening thus contributed to the resurgence of civil society during the early phases of Mexico's political transition. Another typical consequence of media opening is increased scrutiny of government actions and decisions. In Mexico, for instance, more aggressive coverage of previously "closed" topics by elements of the print media produced a series of revelations that reverberated throughout the Mexican political system. Even broadcast media, locked in competition for market share, began to cover potentially shocking political events. The ensuing scandals helped to delegitimize Mexico's authoritarian regime in the eyes of the mass public. Yet another common consequence of media opening is greater coverage of opposition parties during election campaigns. In Mexico, coverage of campaigns became substantially more equitable during the 1990s, contributing to opposition victory in the watershed legislative elections of 1997. The repercussions of more equitable media coverage continued to be felt in the presidential elections of 2000, in which opposition candidate Vicente Fox finally defeated the PRI. Media opening and democratization are thus best conceived as interacting and mutually reinforcing processes. Political liberalization leads to a relaxation in censorship, constrains the arbitrary use of power against independent media outlets, and encourages reform in the legal structure governing the press. At the same time, independent coverage promotes civic mobilization, increases public scrutiny of official actions and decisions, and levels the electoral playing field. Although political liberalization undoubtedly promotes media opening, changes in the media also propel political reform. Because the causes of these changes in the media often lie outside the political system itselfñin the competition between rival media outlets and in the changing norms of journalists themselvesñmedia opening is not simply a function of political reform. These findings have a number of implications for newly democratic and democratizing countries. First, they suggest the circumstances under which tentative initial gestures toward political liberalization are likely to unleash a cycle of political change. Specifically, when media outlets are forced to compete for audiences and journalists have already developed their own internal professional standards, even modest liberalization in the political environment can trigger rapid and thorough transformation of reporting. Changing media coverage in turn exercises a powerful influence on political life, stimulating civic mobilization, triggering scandals, and facilitating opposition electoral victory. Second, the role of market competition in transforming the media suggests one mechanism by which economic liberalization leads to democratization. By stimulating competition, market-oriented reforms encourage media outlets to take into account the demands of their audiences, rather than the preferences of official censors. In general, these changes in coverage help to legitimize opposition forces, delegitimize the old regime, and generate support for political alternatives. They thus increase the odds of regime change. But the importance of market competition also underscores the dangers that high levels of media concentration pose for many new democracies. Lack of market competition makes it easier for media owners to introduce their own biases (or those of their political allies) into news coverage. One typical result is a status quo slant to news coverage, which generally discourages civic mobilization, conceals potential scandals, and favors the political establishment in election campaigns. Where neoliberal reforms have proceeded without much oversight of monopolistic commercial practices, media monopolies and cartels are likely. The persistence of these monopolies and cartels, especially in broadcasting, have lamentable consequences for the quality of democracy in societies that have recently undergone transitions from authoritarian rule. The bulk of the study focuses on the mass media in a single country: Mexico. This approach was based on the presumption that only careful examination of a particular case could successfully untangle the reciprocal relationship between changes in the press and changes in the political system. (That presumption was amply confirmed in the course of research for the project, a result that highlights the continuing value of case studies for comparative social science.) The broader motivation for this case study, however, was to identify patterns and relationships that may be generalizable to other countries. In this sense, the Mexican experience is most valuable to the extent that it sheds light on media opening and democratization elsewhere. As a case, Mexico offered several theoretical and practical advantages over other countries. First, Mexico's press contained substantial internal variation across time, region, and type of outlet (print, radio, television, etc.). Such variation allows for a number of intra-country comparisons, thus adding some measure of robustness to findings culled from a single case. To the extent that the conclusions reached here hold across different regions, time periods, types of media, and firmsñalbeit within one countryñthey are more likely to represent a general dynamic. Second, the history of Mexico's media made that country an important test case for any argument that changes in media coverage can exercise an independent influence on political transition. For years, the Mexican media were harshly (and justly) criticized for their association with the old regime. Television, in particular, was subjected to almost ritual pillory by a range of opposition and civic groups for more than a decade. If Mexico's media were able to act as forces for political change, it seems likely that the mass media can play a similar role in other countries. Third, Mexico offersñor rather, at the time the study was undertaken, offeredña unique opportunity to observe media opening and democratization in real time. For subjects as difficult to analyze as the role of the mass media in political transition, being on the ground at the right moment afforded crucial advantages. Interviews recorded people's actual thinking, rather than their recollections and confabulations after the fact; surveys documented opinions that would otherwise never be known; content analysis salvaged material that might have been discarded or destroyed. In short, real-time observation captured the contingencies and complexities of the moment. Ex-post explanations of other cases may be simpler, but they are rarely more informative and are liable to miss crucial features of the context. Finally, though perhaps least important from a comparative perspective, is the attention that the transformation of Mexico's media has received in recent years. In part, this attention is due to the remarkable scope of change in the media over the past fifteen years. Whatever its flaws, the current media environment is one of the elements of Mexican social life that most gives politics in that country a modern, democratic hue. How Mexico's press liberated itself from a dense thicket of institutional and cultural constraints, and what effect its liberation had on democratization, is simply a remarkable piece of political history. Quite apart from its broader applicability to other countries, the story of media opening in Mexico deserves to be told. Part 1 (chapters 2-4) provides the background for this story by describing the old system of media control in Mexico. Chapter 2 offers a thumbnail sketch of the rise and fall of the "perfect dictatorship" that ruled Mexico from the 1930s until the mid-1990s. Chapter 3 discusses the old system of corruption and censorship that governed most of Mexico's media establishment until the 1990s. Based on dozens of interviews with journalists and government officials, it describes how the Mexican regime relied on subsidies, bribes, and the manipulation of broadcasting concessions to create a relatively docile and dependent press. Chapter 4 then analyzes the consequences of media corruption and censorship for news coverage. In general, reporting under the old regime was marked by (1) official control of the public agenda, (2) selective silence on issues of particular sensitivity to the government, and (3) partisan bias in favor of the ruling party. The net effect of media coverage was thus to marginalize regime opponents and legitimize authoritarian rule. Part 2 (chapters 5-6) analyzes the breakdown of the old system of media control. Chapter 5 relies on interviews, content analysis of Mexico City newspapers, and comparisons across different cities to trace the process of opening in Mexico's print media. It explains how independent publications emerged outside the traditional system of press control and how they were subsequently able to resist official pressures. Animated by a new journalistic ethic and sustained by a growing readership base, these periodicals formed the core of Mexico's nascent Fourth Estate. Chapter 6 repeats this analysis for Mexico's broadcast media, based on interviews, ratings data, and content analysis of leading television programs. It shows how market competition helped pry open Mexican radio and, to a lesser extent, television. By the late 1990s, Mexican broadcasting was governed primarily by commercial rather than political considerations. Together, chapters 5 and 6 document how market competition and journalistic professionalism led Mexico's media to become (1) more open to opposition and civic perspectives, (2) more assertive in covering touchy subjects, and (3) more impartial in electoral reporting. 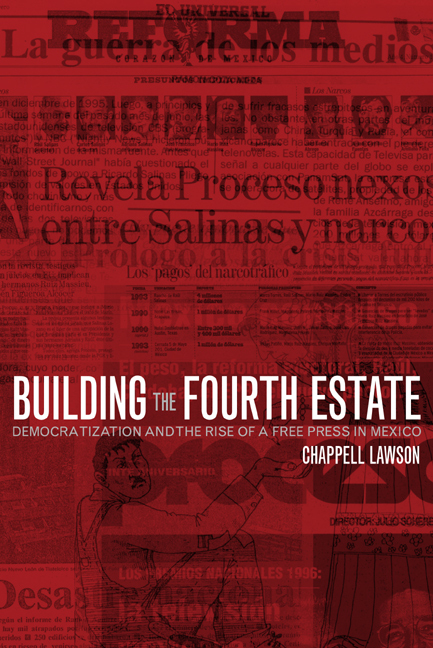 Part 3 (chapters 7-9) traces the political consequences of media opening in Mexico. Chapter 7 describes the role of two independent publicationsñLa Jornada newspaper and Proceso magazineñin the rebirth of Mexican civil society during the second half of the 1980s. It argues that media opening played an important role in legitimizing the civic groups that emerged during this period and in encouraging political organization outside of the regime's traditional state-corporatist apparatus. Although changes in press coverage were not the sole cause of civic mobilization during this period, they did help reinforce mobilization that was already under way. Chapter 8 analyzes how increased assertiveness in the media triggered a series of political scandals. Based on a review of twelve shocking political events, it argues that media opening was the primary cause of the devastating scandals that rocked Mexican politics during the mid-1990s. These scandals helped to delegitimize Mexico's crumbling authoritarian regime in the eyes of the mass public and to increase support for political change. At the same time, scandals signaled to elites that the rules of the political game were changing. Increased media coverage of previously closed topics thus propelled Mexico's democratic transition. Chapter 9 analyzes a more familiar type of media impact: the role of the media in shaping public opinion and voting behavior. It focuses on the watershed elections of 1997, which cost the PRI control of Congress, drawing on a three-round panel survey of approximately 400 respondents over the course of the campaign. The results of this survey point to powerful media influences on electoral preferences. By eroding support for the PRI, changing media coverage propelled democratization. The final section (chapter 10) returns to the broader, comparative issues that inspired the study. Chapter 10 first reviews the causes and consequences of media opening in Mexico. It then attempts to generalize from the Mexican case to media opening and democratization in other contexts. The chapter concludes by linking findings about the role of market competition to broader debates about the political impact of market-oriented reform. The Mexican experience strongly suggests that economic liberalization contributed to media opening, which in turn undermined Mexico's one-party regime. In at least one important way, therefore, market-oriented economic reforms promoted democratization. These same findings, however, also highlight the dangers that attend market-oriented reforms should unregulated competition lead to cartelization or monopolizationñas in the case of Mexican television. In that case, economic liberalization may produce a media establishment that is relatively independent of government control but beholden to the interests of private actors. Such a media regime tends to diminish the quality of democracy, both in Mexico and in many other countries that have recently competed their transition from authoritarian rule. 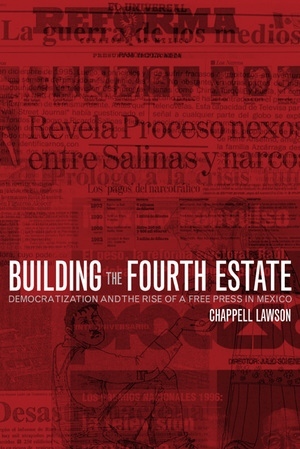 Based on an in-depth examination of Mexico's print and broadcast media over the last twenty-five years, this book is the most richly detailed account available of the role of the media in democratization, demonstrating the reciprocal relationship between changes in the press and changes in the political system. In addition to illuminating the nature of political change in Mexico, this accessibly written study also has broad implications for understanding the role of the mass media in democratization around the world. Chappell Lawson is Assistant Professor of Political Science at the Massachusetts Institute of Technology.